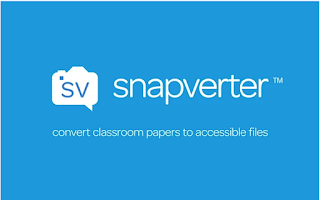 Snapverter is a good application that allows you to convert classroom papers, images and pother teaching materials into Google Drive friendly files. ‘Snapverter is an add-on for Read&Write for Google that converts printed documents and inaccessible digital files into readable PDF files for easy sharing and reading aloud in Google Drive.’ Using OCR technology, Snapverter is able to recognize text from worksheets, handouts, book pages, and other printed materials. The way Snapverter works is very easy: you simply take a picture of a document using the camera of your device and save it to the folder Snapverter created for you in your Google Drive. ‘Documents are converted into accessible PDF files for easy sharing with your students in Google Drive. Then use the powerful tools in Read&Write for Google Chrome to help struggling readers, ESL/ELL and students with dyslexia or learning difficulties. Snapverter also converts Bookshare digital publications in DAISY format to accessible EPUB files for reading aloud with Read&Write for Google Chrome.’ The first 10 scans in Snapverter are free after which you will have one snap per week. Also, Snapverter purchase requires Read&Write for Google™ domain or group license subscription.